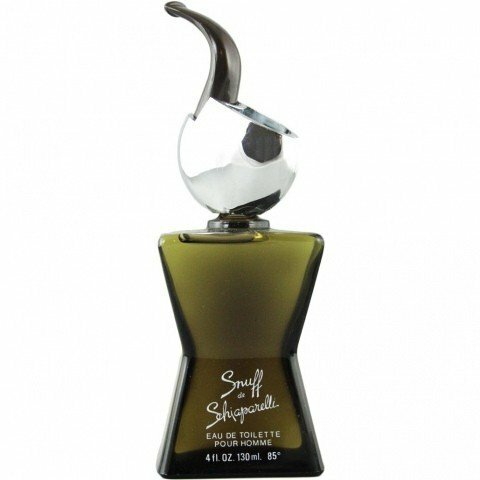 Snuff (1977) (Eau de Toilette) is a popular perfume by Elsa Schiaparelli for men and was released in 1977. The scent is spicy-leathery. It is still in production. That must have been him, the man of their dreams. The Man In the imagination or in the real life of Elsa Schiaparelli. The man who touched her heart and awakened her longings. A strong shoulder to lean on. Male and charming. Sovereign and strong in spirit and soul. A man who dried her tears or made them flow. A man who managed to silence her with a single glance when she raved and boiled with anger. The man she could handle in all situations. Who knew how to take them with skin and hair and all their airs and graces. A man who carried her tenderly dominant on safe hands. Maybe she wanted the perfect mixture of her wishes and ideas. A gentleman,dandy,gigolo or rebel. One that united everything she ever wanted. She wanted the perfect man. And when she created Snuff she had at least already created his aura with it. Snuff begins with an unmistakable soapy lavender note. Lightly underlaid with an almost metallic bergamot which makes the top note appear cool and fresh. Very light and freshly tender, herbaceous green chords underline this entry. After some time Snuff starts to change. It becomes darker green in its projection and the heart note. Nuances of pine and patchouli run through the perfume. Earthy and ethereally woody, Snuff glides into darker climates and continues to draw the lavender note behind it. In its base note, Snuff is subtly smoky and leathery with oak moss and a very delicate frankincense note. With a minimal vanilla chord, it also swings slightly into a tobacco note. This note is not as easily perceived on the skin as on clothing. It can be seen better there. The lavender also runs from the top note to the end in the base through snuff like a red thread. It gives the fragrance lightness and freshness throughout the whole process. Snuff Is a man through and through. He's got a big XY on his forehead. The chromoset of masculinity. Unmistakable, unmistakable and unsmellable masculine. It contains all the attributes that Elsa Schiaparelli probably wished a man to have. Snuff is tenderly sovereign, masculine striking, elegant charismatic and subtly dominant in its aura. It is never too loud and not too quiet in its Sillage and it is faithful and durable in its durability. Snuff is a gentleman and a gigolo. A good friend and a romantic rebel. Snuff is the scent for me when I want to be a man. Through and through. Snuff is the fragrance that positively underlines and brings out all the attributes in me as a man. No unisex and no gender exchange in the fragrance. Masculine,male,unfiltered and pure. 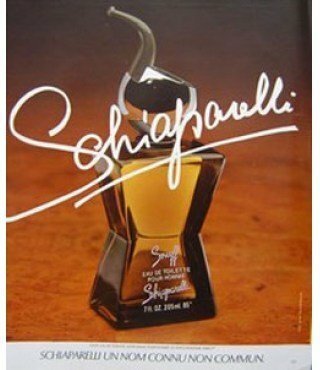 Whatever Elsa Schiaparelli thought when she created Snuff. That's how a man's scent should be or smelled... He! You can't always be a hero, but you can always be a man. Snuff opens with a combination of moderately aromatic lavender and green oakmoss with hints of citric bergamot and relatively dry pipe tobacco. As the composition makes its way to its early heart, the relatively dry pipe tobacco blooms into the starring role with smooth leather now playing co-star, as the oakmoss hangs around in support, joined by mild carnation and slightly lemony green geranium. During the late dry-down the composition turns slightly powdery as dry vanilla joins relatively dry amber as co-stars with hints of sanitized patchouli and the remnants of the oakmoss and leather remaining through the finish. Projection is good and longevity very good at over 10 hours on skin. Snuff is one of those compositions that hooks you in right from the moment you spray it on. As the oakmoss lavender and pipe tobacco trio hit, a smile couldn't be repressed as I already knew Snuff was a winner. That said, it wouldn't be the first time a composition impressed early, only to wimp or cheap out during the dry-down... I can safely say that in this case, if anything, things only get better. By the time the composition has entered its mid-section, the tobacco comes out in full force. This tobacco is not of the sickeningly sweet synthetic smelling variety found in so many other compositions, but rather a quite realistic relatively dry tobacco leaf with the oakmoss used as key support. I kind of liken the effect to pairing the oakmoss heavy Davidoff original with a relatively similar dry tobacco leaf accord in the neighborhood of Havana by Aramis. Before anyone cries foul as to any allusion that Snuff is a Havana (or Davidoff) hybrid clone, it isn't (and besides, it came out before both of them). I only mention those two masterpiece compositions because layering them might give one a bit of an idea of what to expect from Snuff's sublime heart section. Finally, moving to the late dry-down, Snuff goes in an entirely different direction as the perfumer uses the powdery facets of vanilla, amber and even some of the oakmoss in brilliant fashion, never allowing the powder to get in the way of the stark leather, all working together harmoniously as the composition slowly fades. What can I say?... This stuff is absolutely brilliant. The bottom line is the sadly discontinued Snuff (1977 version) is an absolutely "outstanding" 4.5 star out of 5 rated composition that realistic tobacco lovers should go out of their way on the aftermarket to procure... It is safe to say this one immediately did. 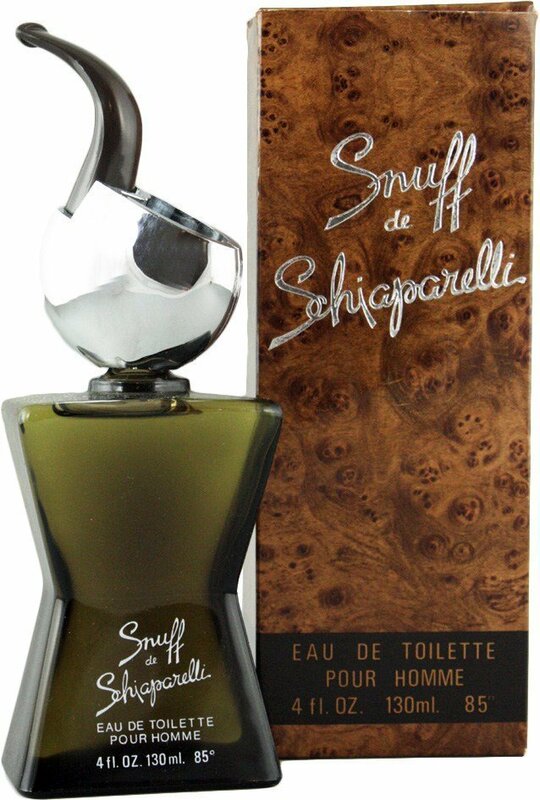 Snuff by Schiaparelli is a really solid and nice woody-herbal aromatic fougère quite on the formal, mature and refined side; mostly centered on mossy notes, herbs, tobacco, lavender, carnation, balsamic-resinous-piney notes, iris. Not a powerhouse for sure, and not even a “dark fougère” with loads of bitter leather like many other scents of its era. There’s some leather here too, but Snuff is more bright and balsamic, more about herbs, woods and pine, with a gentle floral and slightly shady “barbershop” side. It has a really elegant feel of mellow softness all over, which reminds me of Hermès Equipage: that same type of “tobacco bag” smell, which evokes the effortless and relaxed elegance of a gentleman’s weekend. Oddly enough though, it also – and more strongly - reminds me of another scent which has quite a much different mood: the ultra-cheap yet underrated youngster Haschish pour Homme by Veejaga. Try it; I’ve both here around, and to me they share quite a lot of common notes, with two really similar drydowns. Snuff is just a bit darker and more formal initially, and overall smells perhaps a bit more “expensive”, but they’re really close. Well anyway, a solid and totally pleasant fougère, worthy a try, but sadly apparently nearly impossible to find. Write the first Review for Snuff (1977) (Eau de Toilette)!